The Seattle Mariners told the world Thursday that they are moving 44-year-old outfielder Ichiro Suzuki into their front office, but Suzuki made it clear that he is not retiring as a ballplayer. He has no interest in being traded, and won’t be playing for the duration of 2018, but next spring, Suzuki plans to be in uniform for the Mariners hoping to make the club. 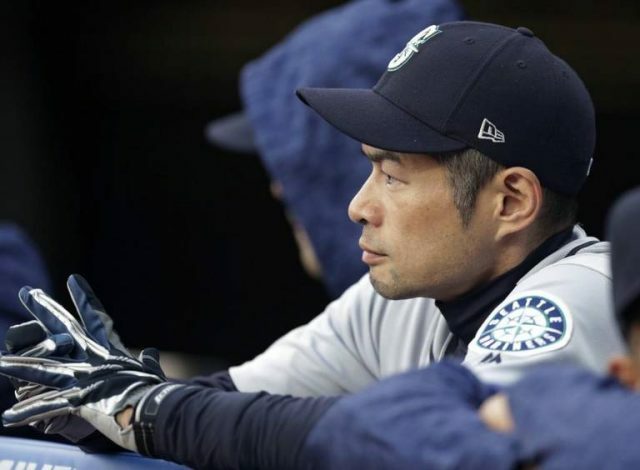 “He doesn’t plan on retiring,’’ John Boggs, Ichiro’s agent, told USA TODAY Sports. “He’s morphing into the role. He’ll still be traveling with the team, work out with the team every day, but he just isn’t going to be allowed to play. The Mariners, the only team to offer Suzuki a contract last spring, needed a roster spot and selected right-handed pitcher Erik Goeddel from their Class AAA Tacoma club. When they need another outfielder, they can summon veteran Jayson Werth, who they signed in April and is playing in the minors. Yet, while Suzuki agreed to join the front office as a special assistant to the chairman, he made it clear that he’s not retiring. Nor will he seek a trade elsewhere. But you better believe he’ll be back in spring training in 2019 hoping to make the Mariners. “He really doesn’t want to play for another organization,’’ Boggs said, “especially this year. The Mariners is where he wants to be. The only thing that could have been created is to keep him in the organization where he wants to be with, and keep the door open for the future. The Mariners open the 2019 Major League Baseball season in Tokyo, playing a pair of March games against the Oakland Athletics. Suzuki has played in just 15 games for the Mariners this season, and has struggled, hitting just .205 without an extra-base hit. Yet, he’s a future Hall of Famer with 3,089 hits, and the Mariners plan to treat him with the ultimate respect. “We want to make sure we capture all of the value that Ichiro brings to this team off the field,” Mariners GM Jerry Dipoto said in the team’s release. “This new role is a way to accomplish that. While it will evolve over time, the key is that Ichiro’s presence in our clubhouse and with our players and staff improves our opportunity to win games. That is our No. 1 priority and Ichiro’s No. 1 priority. “With Ichiro’s track record of success, his personality, his unique perspective and his work ethic, he is singularly positioned to impact both our younger players and the veterans in the clubhouse. We really don’t want him to change anything that he’s doing right now, with the exception that he will not be playing in games. Suzuki, whose unique approach at the plate was only matched by his one-of-a-kind flair off the field, has amassed a staggering 4,367 hits over his career in MLB and Japan. He is a shoo-in for the Hall of Fame. He has often insisted that he will play until he is 50 years old. Yet after the Mariners removed him from a playing role, it would appear unlikely they’d warm to the thought of a 45-year-old Suzuki in 2019. His 2018 Seattle homecoming came on the heels of a winter in which he, like dozens of veteran major leaguers, awaited a call from a club. It appeared his career might have ended with no phone calls, but the Mariners signed him to a one-year deal in March, shortly after outfielder Ben Gamel suffered an oblique injury. Now Gamel is back. Werth could be on the way. And Suzuki is headed upstairs – but still not ready to call it a career.